"Based in Ottawa, Andrew Wright is an artist for whom photography forms the core of his practice. This is not to say that he always or only creates photographs – his oeuvre encompasses performance, video, sculpture and installation – but rather that he always engages with the science and technology of photographic image-making. Perhaps more than any other Ontarian artist, he demonstrates an in-depth knowledge of the tools and techniques, both historic and contemporary, by which light is transformed into image. This knowledge, which has led him to experiment with the camera obscura, the lens and the model rocket, enables him to circumvent the conventions of the medium and thereby create works both in and about photography. 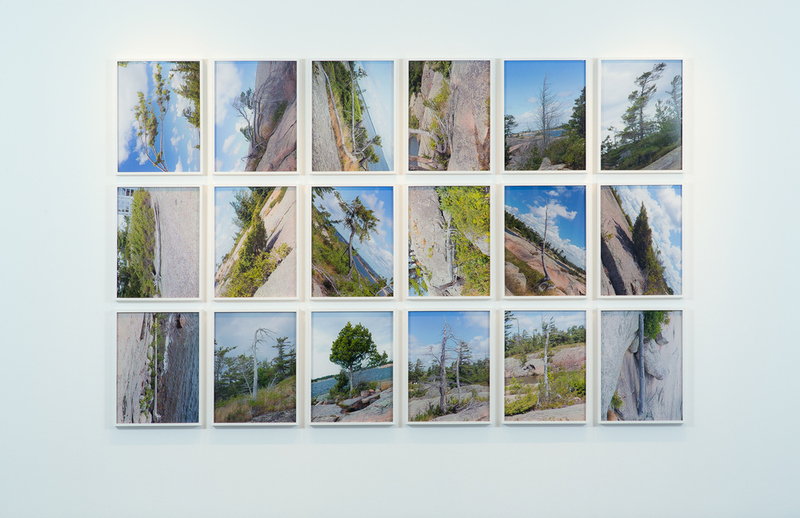 With Tree Corrections (2013), he engages in a formal exercise with the genre of landscape photography, effectively turning it on its head. 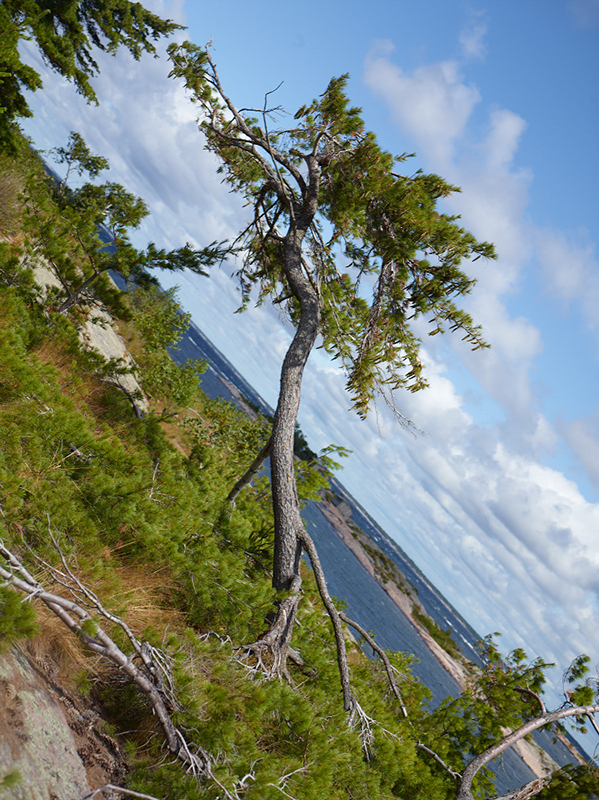 The result is a series of photographs of windswept trees precariously perched on the rocky shores of Georgian Bay. 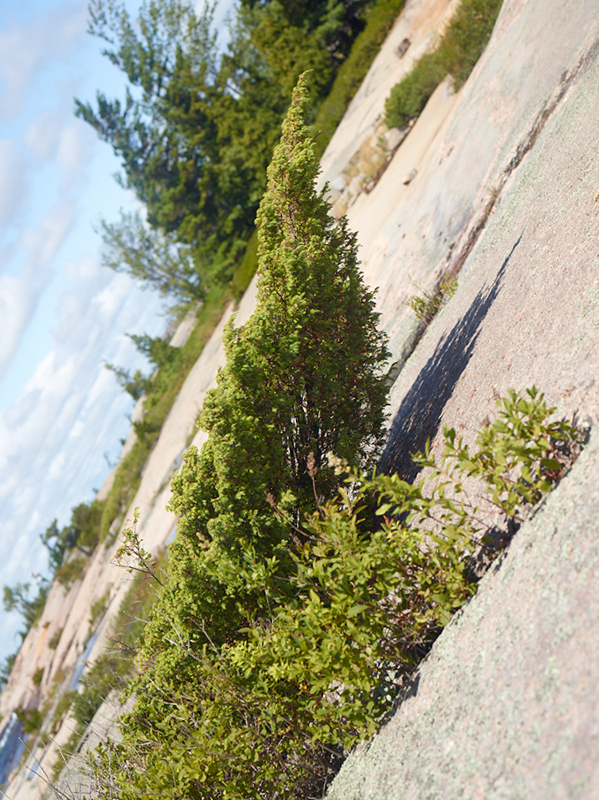 Known as tuckamore in Newfoundland parlance, these trees, battered and buffeted by relentless winds, now grow at various angles to the earth. Wright's "corrections," which consist of rendering the tree vertical within the photographic frame, restore the verticality that one conventionally expects, although the surrounding landscape appears skewed as a result. In this work, he invites viewers to engage in the perception of nature by considering the nature of perception."